Originally foun ded to maintain white supremacy in the South immediately after the Civil War, the Knights of the Ku Klux Klan was revived in 1915 and attracted membership throughout the United States. In addition to white supremacy, the new Klan preached anti-Semitism and anti-Catholicism in response to the backgrounds of new immigrants to the U.S. The message began to resonate in the post World War I era. While spreading its doctrine of hate and intolerance, the KKK claimed to be fighting for traditional American values. In July 1921 William Allen White wrote an editorial in the Emporia Gazette warning of the coming of the Klan and its growing influence. In October 1922 Governor Henry Allen warned that the Klan had "introduced into Kansas the curse that comes to civilized people, the curse that rises out of unrestricted passions of men governed by religious intolerance and racial hatred." Despite these harsh attacks by White, the governor, and other state leaders, it was estimated in May 1923 that 60,000 Kansans belonged to 30 local Klan organizations. Governor Allen and White fought the Klan's control in Kansas. White campaigned for governor in 1924 on an anti-Klan platform. He ultimately lost the election but raised awareness about the organization. The next year the state charter commission ruled against the Klan and the Kansas legislature outlawed its activity in the state. America for Americans (above right) is an example of a Ku Klux Klan pamphlet. 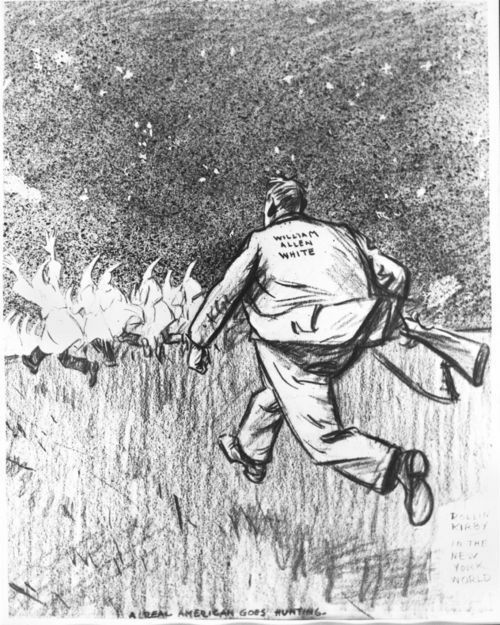 The cartoon at the left depicts William Allen White's attempt to challenge the Klan. Find more materials on Kansas Memory relating to the Ku Klux Klan.